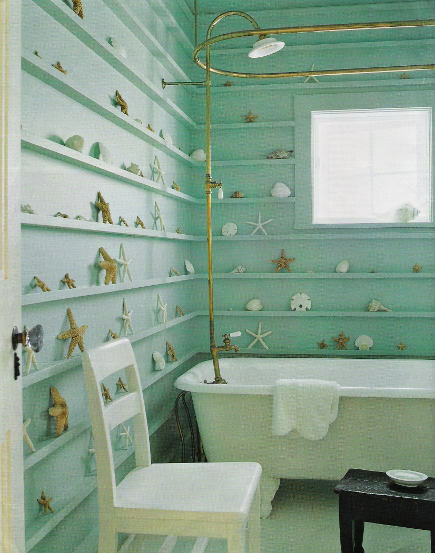 Who doesn’t love a beach cottage bathroom with colors and motifs that suggest the ocean? 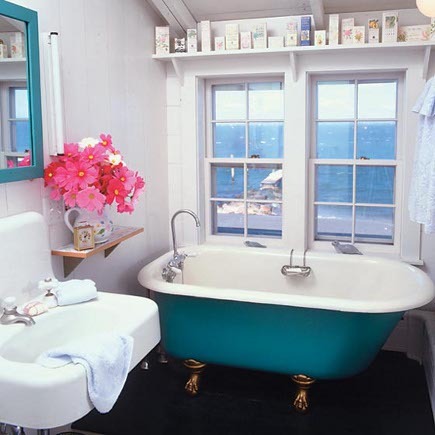 I’m crazy about a beach cottage bathroom. I know this style isn’t breaking any new ground but it remains popular because it’s casual and natural. Beach coottage bathrooms have been shown on every blog from here to Patagonia, but still… What I find attractive is their lack of perfection and eccentricities and the inevitable vintage tubs. When coastal style is factored in, the colors run to the blues and greens. The aqua bath [above] drives home the oceanside them with very clever shallow shelves that wrap around two walls in the rural French home of an art and antiques dealer. Designed by the great Jacques Grange, in the style of Swedish designer Carl Larsson — whose house Sundborn is included in our 10 Great Historic Homes — the shelves are just deep enough to display a starfish and shell collection which really makes this bath unforgettable. The shelves are a very clever way to distract from a small window on the top wall that’s fairly high up on the wall. Adding the display, and framing the window to be part of it, is very smart. This was one of the first photos I collected when I started on our house and this color inspired my seafoam guest bath. How great would it be to sit in this small tub and look out over the ocean? That’s made especially easy by the low windows in a bath with a dormer ceiling (you know it’s on the second floor). The painted planked walls, ceiling and storage shelf keep things simple. But the touches of turquoise on the mirror and bath — plus the retro style fixtures — are perfect together, even with bare naked fluorescent bulbs for lighting. The very essence of beach cottage style is expressed here and underscore the romance and nostalgia that goes along with a style of living that takes its cues from the landscape. I love that first pic! I agree it’s totally impractical, and the dusting alone would drive me batty(we have a few starfish in the boys’ bath, and boy are they ever a PITA to dust,) but it doesn’t stop me from loving the look. Thanks for sharing. Agree with Lax…Love the look, wouldn’t want the upkeep. My favorite of the bath decor is the big window with the real beach/ocean outside. I’m not a bath-lover, but could spend hours in that great tub, listening to the waves. I like the idea in the third photo down. Wish I had thought of that!